Abram knew how to have honest conversations with God. On one occasion, God promised to protect him and give him a great reward. One might think Abram would’ve responded with a polite and enthusiastic thank-you. But he did not. Abram replied, “O Sovereign LORD, what good are all your blessings when I don’t even have a son? Since you’ve given me no children, Eliezer of Damascus, a servant in my household, will inherit all my wealth. You have given me no descendants of my own, so one of my servants will be my heir” (Genesis 15:1-3). A little blunt, perhaps? A bit on the raw side? Maybe. But God didn’t seem to mind. He could have responded, “Now, now, Abram. Watch your mouth,” but He didn’t. Instead, He took Abram’s words in stride and carried on with the conversation. God wants us to converse with Him. And He values honesty as part of that communication. Why? Because honesty indicates trust on the deepest level, a confidence in the other person’s love and respect. If we can’t be honest about our feelings with God, then we need to ask why. Perhaps we’re afraid to be honest with Him because we think He might reject us. Maybe we’re afraid to tell Him how we truly feel because we know we’re in the wrong but don’t want to change. Are we afraid because it didn’t go well for us when we were transparent in the past with a friend or family member, and we’ve carried distrust into our relationship with Him? Regardless of how we feel about having honest conversations with God, the truth is that He wants to hold them with us. So, let’s do it. 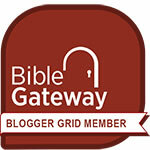 Let’s forego the formalities and talk to God as though He’s our best friend. Here are three things to remember when having honest communication with the Lord. Remember that God knows our thoughts and feelings. He knows our thoughts before they cross our minds and our words before they cross our lips. Nothing’s hidden from Him, so we needn’t bother with religious-sounding jargon in hopes of impressing Him or covering up something that shouldn’t be there in the first place. Nothing we say surprises or shocks Him. As a parent, I love my kids and long for them to be real with me. If they felt they couldn’t be honest, I’d be hurt and eager to resolve the issue. God is our heavenly Father and longs for a healthy, vibrant relationship with us. Does He not hurt when we, as His kids, don’t trust Him enough to be real with Him? Remember that God is God and we are not. When I encourage open and real conversations with God, I’m not giving license to spew disrespect at Him. Because He is who He is, He deserves to be honored. He deserves to be trusted with our emotions. And He deserves to be invited into every detail of our lives because He truly does love us and have our best in mind. He knows our hurts and disappointments, and He’s the One who can heal and restore our brokenness. 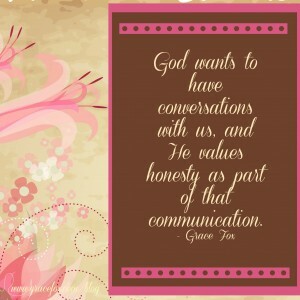 What are your thoughts about having honest conversations with God? Do you experience them? How do you sense He responds to your honesty? Thanks for this, Marge. God bless you. Thanks for stopping by and taking the time to read and comment. In a world where we’re inundated by information from every angle, I’m humbled by this.